There are more online payment options than ever before and as an online entrepreneur, you want to offer as many as you can on your site. In other words, the more online payment options you offer, the more online payment processing you'll do on your site and the more money you'll make. If you were only going to offer one online payment option to prospective buyers, (which I strongly discourage!) this would be the one to choose. Credit cards are still the most popular way to pay for goods and services online. To set up credit card processing on your website, (MasterCard, Visa, American Express, Discover), you need to get an Internet merchant account (an exception to this is Paypal, which offers payment solutions which do not require a merchant account). You can get an Internet merchant account through your local banks. Notice I say banks; to get credit card processing of all the major credit cards on your website you may need to get Internet merchant accounts with two separate banks as many banks only deal with some of the credit cards involved. You can also get an Internet merchant account through a third party merchant account provider, such as Merchant Accounts, Beanstream, Moneris, PSiGate or InternetSecure. 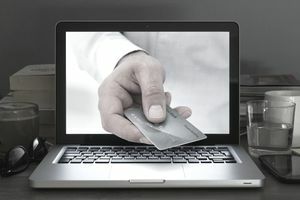 The advantages of getting an Internet merchant account through a third party merchant account provider are that most don't require any security deposits (unlike banks), are quickly set up, and often can be bundled with e-commerce service packages that include the Internet gateway you need for online credit card processing (Web point-of-sale) and a shopping cart. The disadvantage is higher fees. Discount fees, in particular, tend to be higher than if you had set up your Internet merchant accounts through the banks. It is unfortunate, but some merchant account providers have hidden or unclear charges in their contracts. If you see a deal that looks too good to be true, then it probably is. Make sure you get a complete written listing of all fees before you sign on with a merchant account provider. Wherever you get your Internet merchant account, you will have to also purchase an Internet gateway service. The gateway verifies information, transfers requests and authorizes credit cards in real time. All five of the companies I've mentioned above offer these credit card processing services as well, but there are many others that do too – including PayPal. PayPal provides an all-in-one online payment solution that does not require a merchant account. The Website Payments Standard program lets you accept Visa, MasterCard, Discover, and American Express credit card payments as well as bank transfers and offer PayPal as well – with no monthly fees, setup or cancellation fees. PayPal charges you a fee of 1.9 to 2.9 percent of transaction plus 30 cents per order, depending on your company's sales volume. The PayPal option is an ideal payment solution for a business on a low budget that needs to get started with eCommerce quickly and easily. PayPal also offers an upgraded version of Website Payments Standard called Website Payments Pro, where customers check out right on your site rather than on PayPal's (currently available only in the U.S.). They also offer a PayFlow Gateway and PayPal Express Checkout for businesses that already have Internet merchant accounts. Compare PayPal services here. With numbers like that, this is an online payment option you definitely want to offer your customers if you’re selling online. Interac Online is one option that allows your customers to pay for goods and services online directly from their bank accounts. It's convenient and secure for customers because they don't have to share any of their card numbers or financial details when making a purchase; payment is completed through their own financial institutions. To start offering Interac Online on your website, you have to go through one of their certified acquirers or online payment service providers, such as Beanstream, Moneris, Internet Secure or PsiGate. Here's their current list of online payment service providers. UseMyBank is another Canadian company that provides online debit payment services. Like Interac Online, buyers use their existing Online Banking bill payment service with their own bank to pay for your goods or services online and the payment is directly debited to the selected bank account. UseMyBank fees "will be assessed upon activation of account" according to their website. A discount rate of 1.5% to 5% and a minimum $1.50 fee per transaction are posted. There is also an account fee. To get started using UseMyBank on your website, apply directly through the UseMyBank website. Some of your potential customers are people who just aren't comfortable with any of the online options outlined above or people who want to talk to a live person. If you want to fully monetize your website and make all the sales that you can, it's important that you give these people ways to pay too. Include a toll-free number and an order form that customers can fill out and email or snail mail if they prefer. The success of your online business depends on sales. So, why deliberately decrease your sales potential by limiting the ways potential customers can pay for your products and/or services online? Make as many sales as you possibly can by offering as many online payment options as possible on your site.